This built-in shelving is something that you would pay a small fortune to a contractor for – but you can do it for so much less. Those wooden crates can be purchased at most hobby stores as well as Dollar Stores for around $10 each, if you don’t already have some on hand. You use them to create this amazing shelving unit around the headboard or you could do this in the living room around your television. This is an amazing project and one that doesn’t take long. 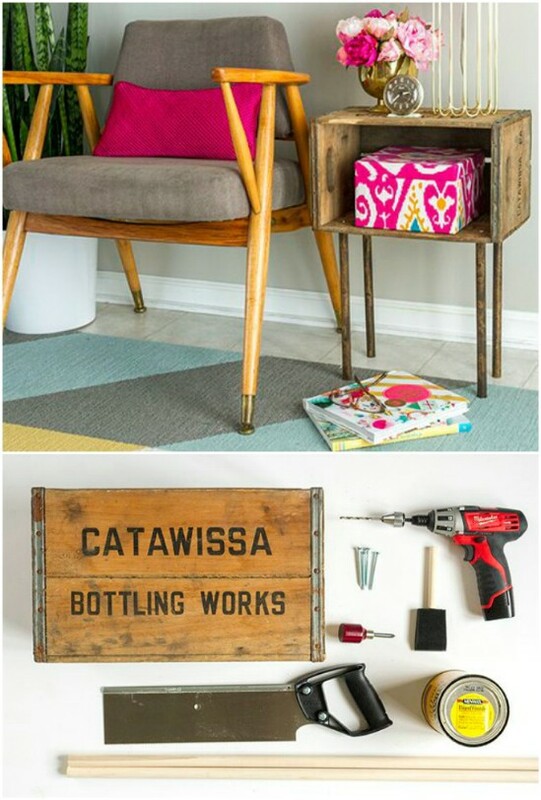 You can turn a vintage milk crate into an ottoman with a pillowed top and plenty of storage. You don’t even have to sew – the top is stapled on in true upholstery style. 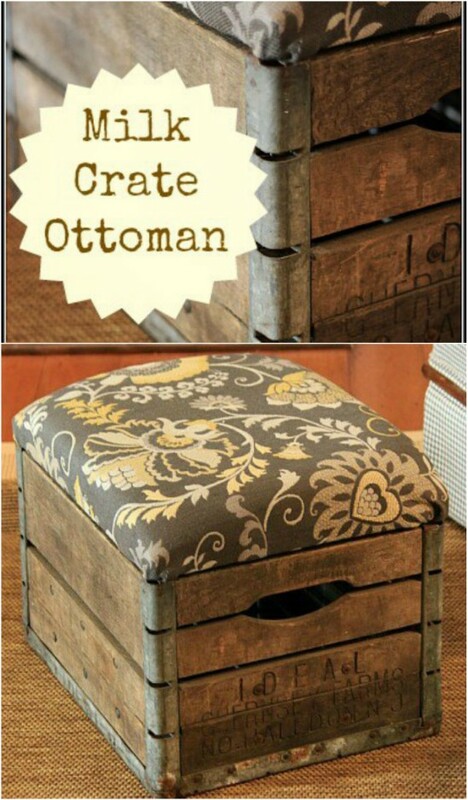 If you’re planning a rustic look for the living room, this ottoman is a definite must. How adorable is this little car garage? It’s made with an old wooden crate and some cardboard mailing tubes, which you can pick up at postal stores for just a few dollars. I love the ingenuity of this. Not only does it neatly store those little cars when they’re not in use, it doubles as a toy since it’s a “garage”. Kids are going to adore it! Most people – me included- would love their keys if they weren’t hanging somewhere safe. I have a shelf beside my entry door that houses all the car keys so we always know where they are. 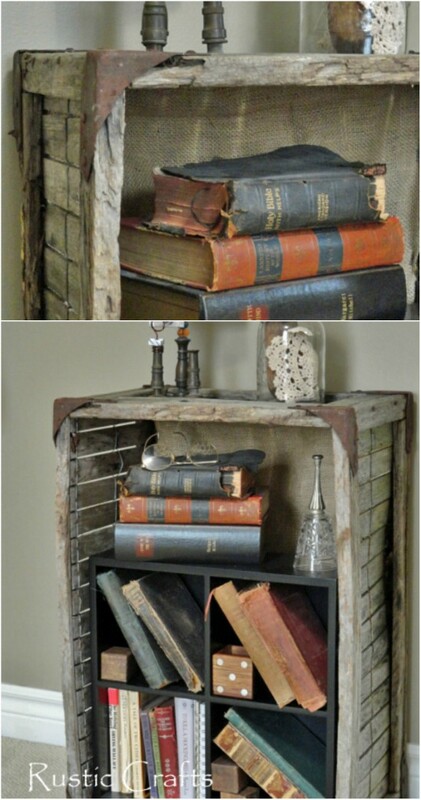 I really love the idea of turning that shelf into a vintage looking piece with an old crate. 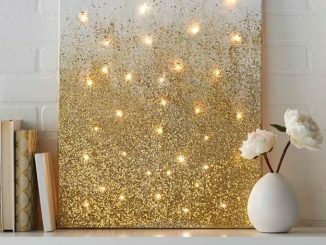 You would just need to add hooks and maybe stencil in something clever and then hang. 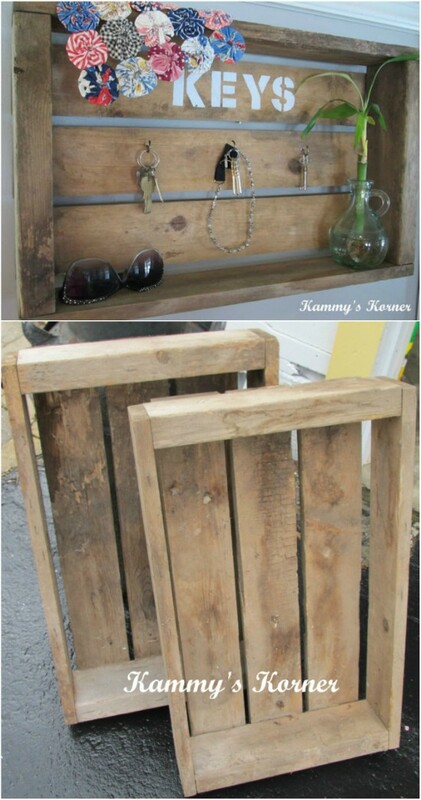 Turn that old crate up on its side and make it a gorgeously rustic nightstand or a side table for the living room. You can add one of those cube shelves from the Dollar Store – they’re about $5 each – and make plenty of storage inside your table. Add burlap or a bit of lace for decoration and you’re all set. 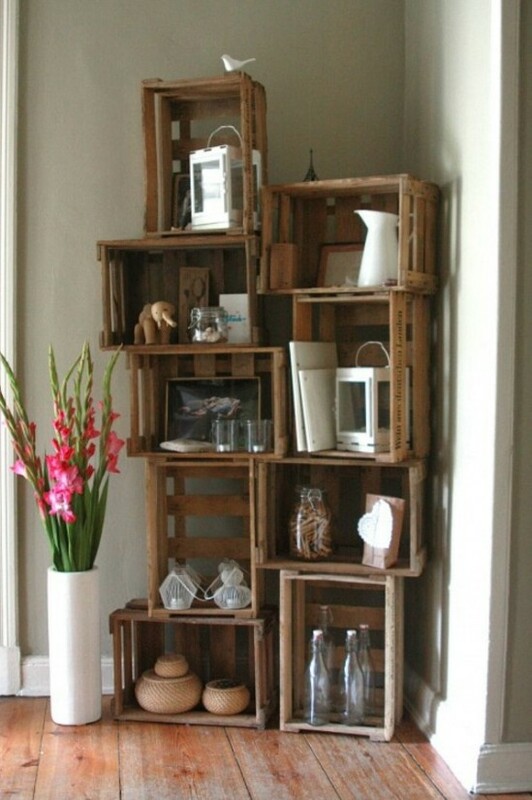 You don’t even have to spend hours turning your wooden crates into amazing décor. You can simply stack them up and use them to house books and other knick-knacks. I do recommend that you secure these somewhat, especially if you have small children or animals in the house. You could simply clamp them with small metal clamps through the slats so that they don’t topple over, and you’ve got a great new rustic bookcase. 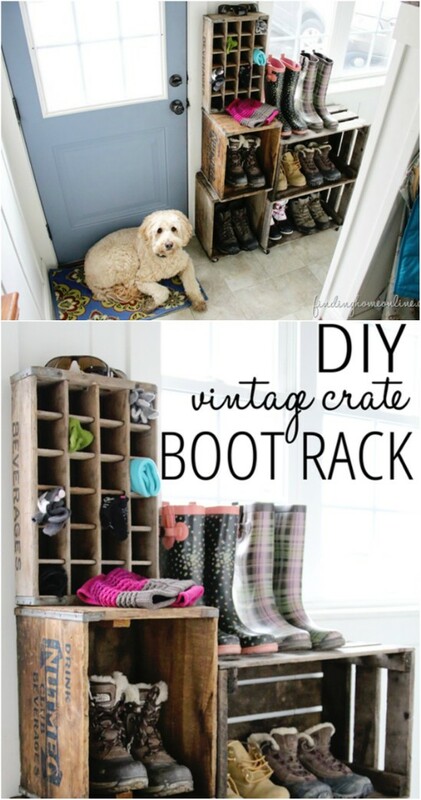 Those old wooden crates would be perfect in the mud room or if you don’t have a mud room, just set them up right inside the back door. You can use them to house muddy shoes and boots, as well as scarves and even put hooks on them to hold jackets if you want. 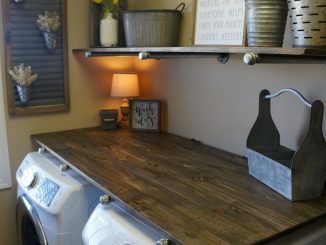 There are so many ways to make a customized mud room rack with those wooden crates. Painting those wooden crates different bright colors makes them perfect for adding a storage unit to your child’s bedroom or playroom. These can be used to house so many toys, depending on the number of crates you have on hand. You can organize toys in each crate which will make playtime and cleanup time much easier and more efficient. 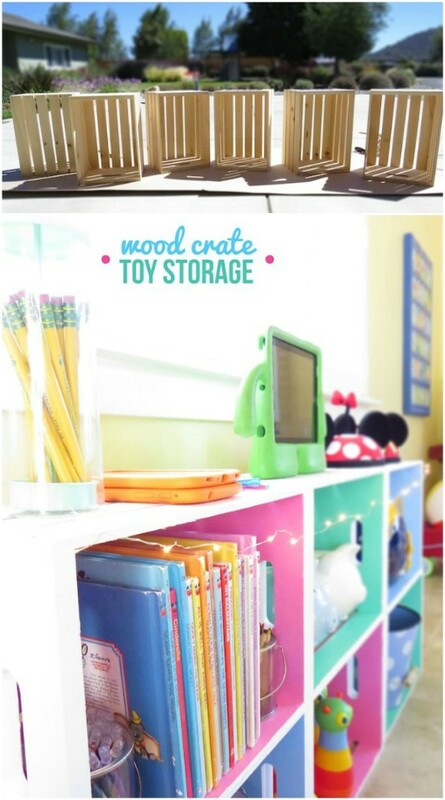 If you homeschool, this would be the perfect storage unit to keep studies organized. Who says you need to spend loads of money on home office furniture? You can make this amazing filing cabinet with sliding drawers out of those wooden crates and it works like a charm to keep things organized and tidy. This would also make a wonderful extra dresser if you need it – you know, because some of us have way too many clothes. However you use it, it’s easy to build and offers amazing storage capacity. I’m a sucker for a unique and creative coffee table project. 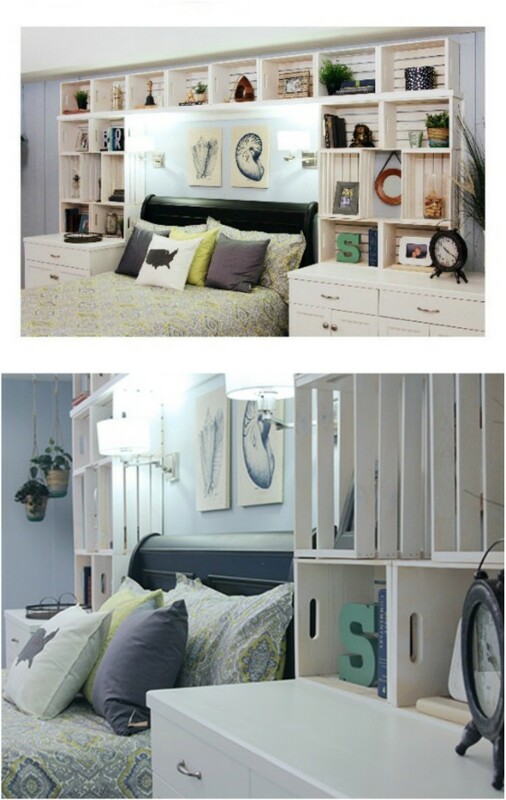 I absolutely love this wooden crate idea. 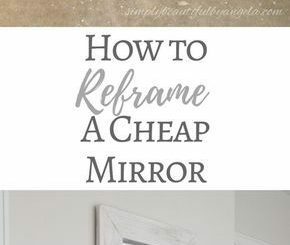 Not only is it beautiful and rustic looking, it also gives you storage and you can stain or paint it whatever color you need to match your living room décor. You’ll need four wooden crates, all the same size to create this as well as plywood and some basic woodworking type tools. You can paint that crate a nice pastel color, add some little legs and some lovely wallpaper to the inside and have the perfect nursery side table. You could use this anywhere really. It’s a gorgeous table and so very easy to make. You’ll need to choose your wallpaper or if you are really creative, you could just paint something on the inside of the table. I really like this side table idea, as well. Instead of standing your crate up on its end, you’ll turn it sideways and add long legs to it. It still offers wonderful storage and an amazing rustic look, but this one has a more retro 60’s look to it, which is really love. Use legs from an old table or chair, or you can pick them up at a thrift or bargain store. Toy boxes are pretty expensive, especially if you get one that’s big enough to hold your child’s toy lot. 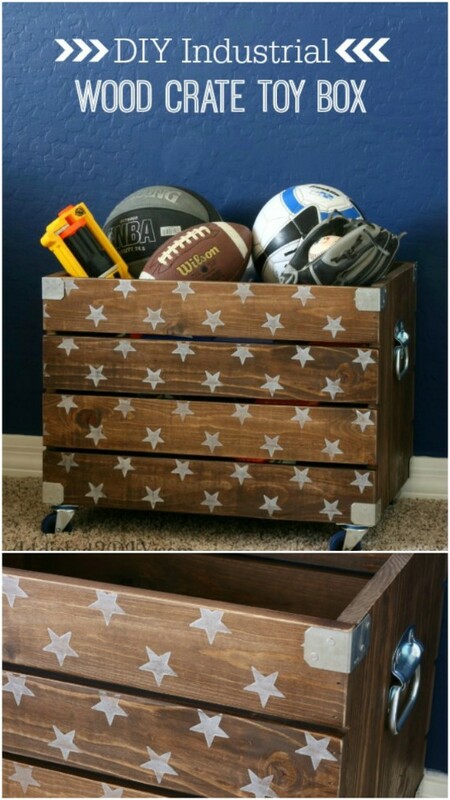 That’s why I love this wooden crate toy box idea. Not only is it big enough to hold several toys, it’s really inexpensive compared to store bought toy boxes. You’ll pay about $25 or so for the crate as opposed to $100 for the toy box. Plus, it’s on casters so it’s easy to move around as needed.